Pumpkin Enchiladas: Gluten-Free. Vegetarian. Pumpkin puree and refried beans come together with a homemade enchilada sauce to create and easy, flavorful, and healthy family dinner. In love with fall, apples, soups, football games. Oh and PUMPKIN!!! Did you know pumpkin is good for more than just a latte or pie? Did you know that it can be savory as well?! Think of pumpkin as sort of like sweet potatoes–they lend themselves beautifully to sweet dishes such as pie, pancakes, muffins, etc But can be just as delicious when kicked up a notch with savory spices. 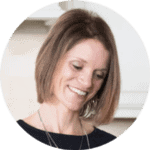 And you all know how much I love to incorporate sweet potatoes into savory dishes–like Southwestern Sweet Potato Hash, Sweet Potato Nachos, and Black Bean and Sweet Potato Chili. So back to the pumpkin. I was looking for a quick dinner the other night–oh you were too?! Imagine that! So now that you are looking for quick, how about frugal? Maybe even meatless? Mexican? Now, that I have your attention (I mean, I think Mexican Recipes appeal to the masses, Ole?!! ), let’s get this fiesta started. Open three cans: diced tomatoes, refried beans, and pumpkin puree. Want to get fancy and make refried beans and pumpkin puree from scratch? Be my guest and your dish will taste insane, but tonight I don’t want to even think about it! Throw the diced tomatoes into the blender and whirl around with a bit of cumin and garlic. Spread a bit of the tomato mixture in a casserole dish. Mix together the beans and pumpkin with taco seasonings–a bit of cumin, chili powder, onion powder, paprika, and garlic powder. Roll the mixture up into tortillas and place in the casserole dish. Pour the remaining tomato mixture over the tortillas smoother with cheese and bake. Are you scared that pumpkin will overwhelm the dish? NOT AT ALL! The pumpkin adds earthiness and creaminess to the beans–not to mention a good dose of vitamin A. My family loved this meal and I bet your family will! No one even missed the meat–including the hubbie!! If you don’t have pumpkin puree, you can use sweet potato puree or carrot puree (it would be about 1 2/3 cups of puree). You can use any tortillas you like here–gluten-free, corn, whole wheat, etc. To keep these Pumpkin Enchiladas vegan, omit topping the enchiladas with cheese. 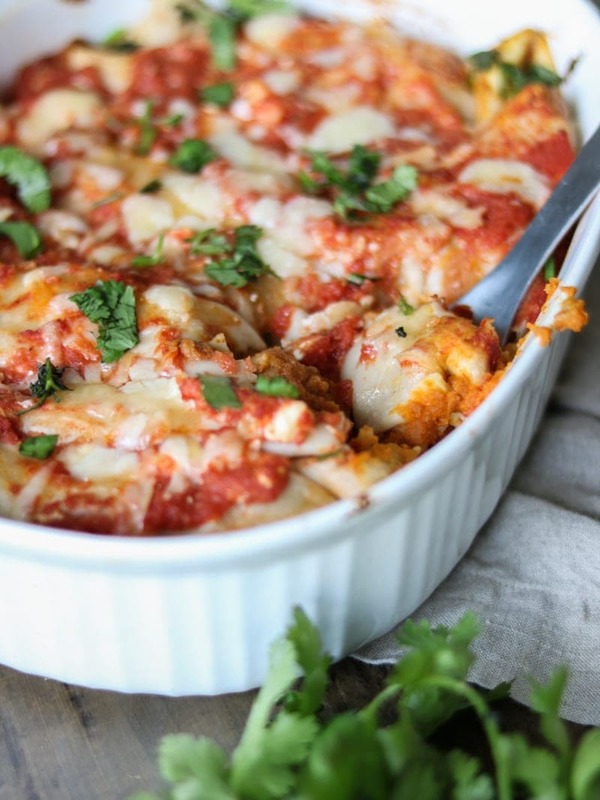 To make these Cheesey Pumpkin Enchiladas–add any cheese you like to the dish. I love a combination of sharp cheddar and feta. But cheddar, colby, queso fresco, even mozzarella works. Simple, economical and wholesome bean and pumpkin enchiladas that come together in 5 minutes with only 5 ingredients (6 if you add cheese). Blend the tomatoes with 2 tablespoons of taco seasoning. Pour a just enough to cover the bottom of a 2 quart casserole dish. Mix together the remaining spices with the pumpkin and beans. Top each tortilla with 1/4 cup of the bean mixture and roll up, placing seam side down in your casserole dish. Bake for 20minutes, until cheese is melted and browned. Top with any toppings you desire. I prefer lettuce, tomatoes, onions, avocado, and Greek yogurt or serve as is. Turkey Pumpkin Chili: from Garnish with a Lemon. The pumpkin adds such creaminess to the chili and helps to mellow out the spiciness. How about a fall salad completed with a pumpkin vinagrette from The Veg Life? Pumpkin Scallop Potatoes From The Blond Cook: Sounds like the perfect fall dish to me! Warm up with a bowl of White Bean Quinoa Chili from Allyson Kramer? 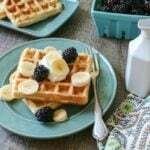 Or try a completely new spin on a waffle in these Pumpkin Cornbread Waffles from Minimalist Baker. I’ve never had pumpkin in anything savory or spicy… these sound so good thought I’ll have to give it a try! Krista, It does seem a bit odd at first to try pumpkin in savory dishes. But just like sweet potatoes, pumpkin works beautifully in savory dishes. I hope you try it and love it! This is great idea! Pumpkin is indeed wonder vegetable-good for almost every dish 🙂 Pinning for sure. Thanks Mila! I would be honored to share at your fall party 🙂 Thanks for the invite. Take care! What a great fall dish! These look absolutely delicious! Enjoy Ginnie! They are perfect for a quick fall meal! I want to eat all of this! Yum! Who knew pumpkin just wasn’t for pies anymore? 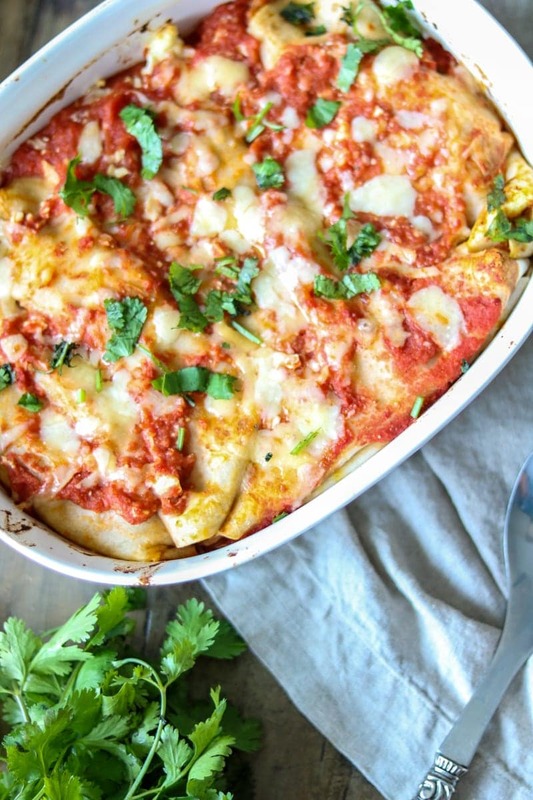 This recipe for pumpkin enchiladas sounds delish and simple! I want to check out the other pumpkin recipes too, they all look so good! Pinned 🙂 Hope to see you sometime at our Snickerdoodle Sunday! I love pumpkin in savory recipes, and it sounds great in these enchiladas with all of those flavors! These sound delicious! The Mexican flavors really compliment the pumpkin quite well. Interesting. Definitely worth giving a try. 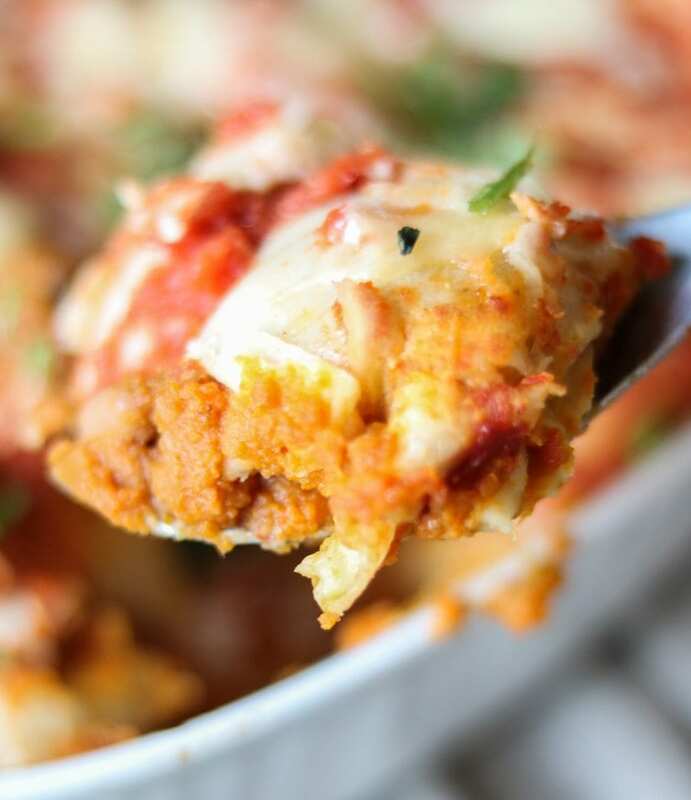 Mexican dishes are a perfect vessel to incorporate pumpkin….I hope you make this soon amd enjoy. How tasty and satisfying these pumpkin dishes look! 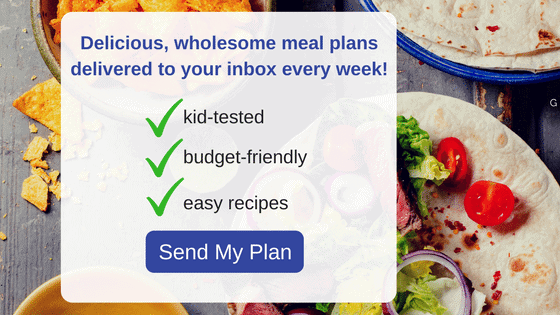 Thank you so much for sharing this healthy and delicious Pumpkin Enchiladas recipe with us as well as the other tantalizing pumpkin delights at the Healthy, Happy, Green and Natural Party Blog Hop. I appreciate it! Absolutely! I checked out your recipe for Kale Enchiladas–yum!! Wow – this looks delicious! I am going to add this to my main dish vegetarian section in my cookbook. Thanks for the recipe. Have a great weekend! Hello cute lady! This looks so good. Pinned. We couldn’t think of anyone better to party with. We hope to see you tomorrow at 7 pm. Thanks so much! Love partying with you all! 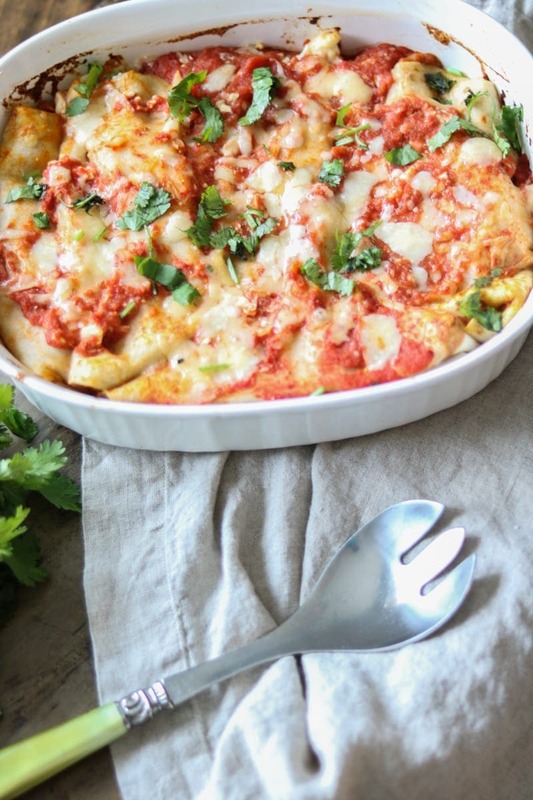 Any kind of enchiladas look delicious to me! Thanks for sharing them with us at Foodie Fridays! We must be thinking the same, I just made some Pumpkin Enchiladas. Your recipe looks delicious, I will sure give it a try. Hope you are having a great day and thanks so much for sharing your awesome post with Full Plate Thursday! I would never have thought about putting pumpkin, but they look great! Thanks for linking up to the Tasty Tuesdays Linky Party at Creative K Kids. I have pinned this post to the Tasty Tuesdays Linky Party. I love pumpkin & Mexican food,but after trying chocolate enchiladas at a restaurant, and them not being my favorite, I am among the afraid. Your description does make them sound good. And I live they are EASY! Pinning to try….and hopefully love. Oh Scarlett, I hope you try and LOVE them. I am not a fan of savory chocolate dishes but this pumpkin truly does lend itself to a savory dish. If you like refried beans and Mexican spices, you can’t go wrong! My little boys loved these! Thank you for this delicious recipe!